This is my third post about the Zen categorization system for logic games. Today, I'm moving out of sequencing into the bread and butter of grouping rules: together. I'll discuss what they are, how to recognize them, how to diagram them, and detail their interactions with a few other rule types. Together rules can occur in the context of a variety of games, and are almost always crucial interactions whenever they appear. By nature, they cause actors to move together, creating blocks that limit where they and other actors can be placed. In today's example game, we'll assign passengers to seats on a bus, allowing us to examine how together rules can work in the same game on two different axes (same row or by window/aisle). 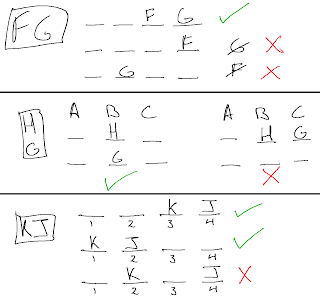 Note that F and G could both NOT be selected in the top panel. A together rule doesn't specify the location of either actor on its own, but when combined with other rules, can cause actors to only fit in particular slots. 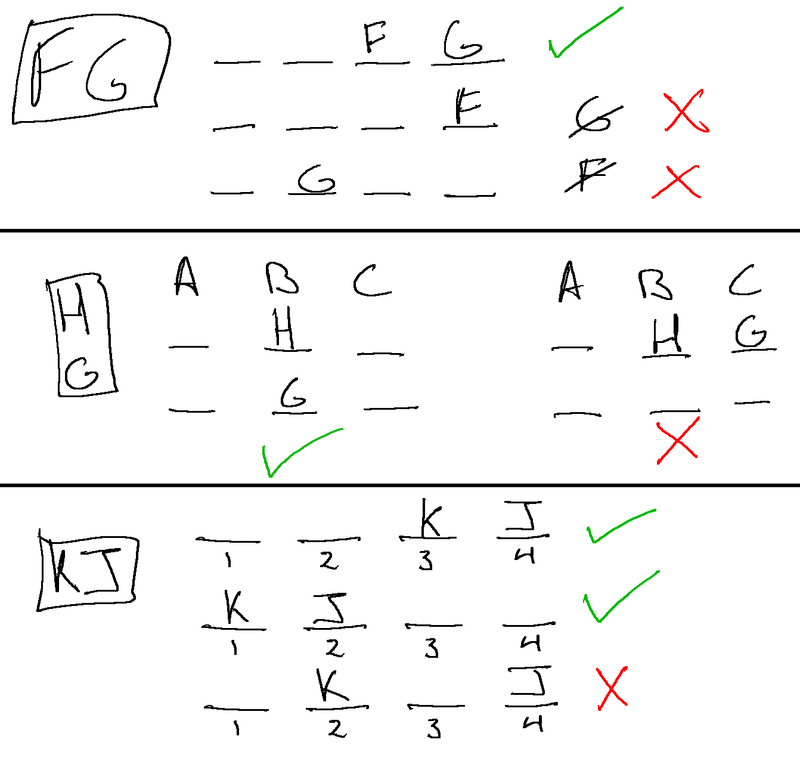 Common examples are "F and G are either both selected or neither is selected" for grouping games, "H and G are assigned to the same group" for assignment games, or "J immediately follows K" in sequencing games. 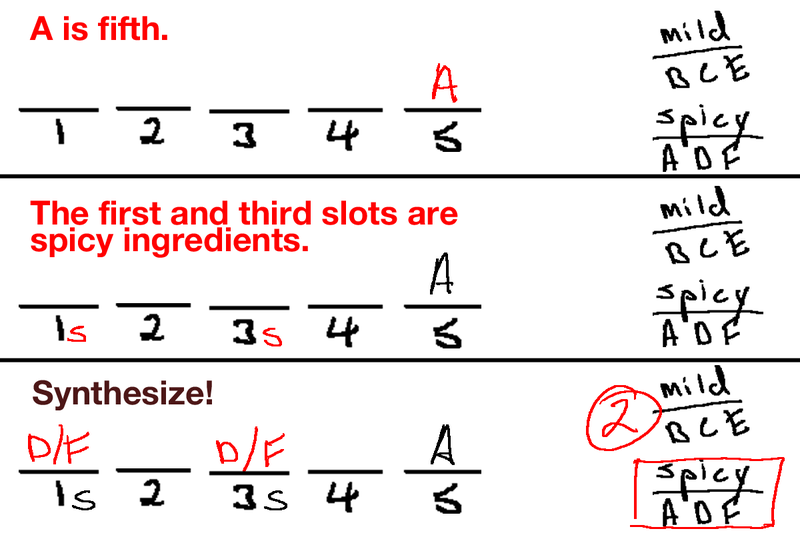 Examples of how to diagram these three rules are shown on the right. 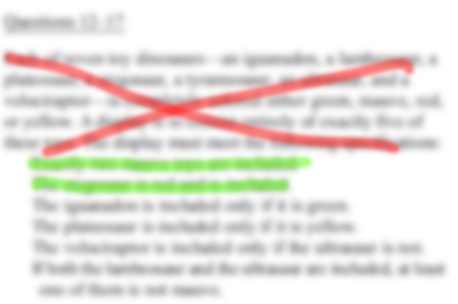 Together rules are never contained in the game's stimulus, instead appearing in the list following the stimulus. Like most other grouping rule types, together rules build upon each other to allow deductions and create limitations on the game. While they sometimes appear as the only grouping rule, it's much more common for them to be paired with separate rules (the opposite of together!). Now let's turn to our example game about assigning passengers to seats. Let's start with 8 seats, and we're going to put 7 passengers (A-G) in those seats. The seats are numbered 1-8, and separated into a first row of 1-4 and second row of 5-8. Seats 1, 4, 5, and 8 are window seats, and seats 2, 3, 6, and 7 are aisle seats. Starting off, we should have a workspace that looks like this. Below are a series of together rules being diagrammed, with the new rule and its part of the diagram in red. The first three rules are together rules, and the fourth is a slot rule. 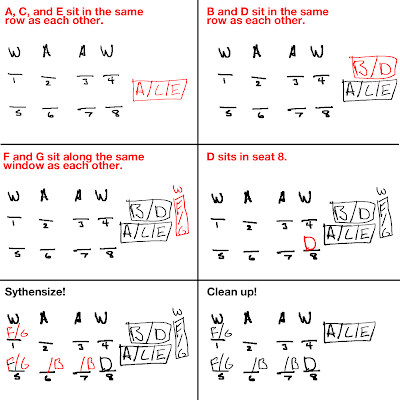 In the last two panels, the rules are synthesized and the diagram is simplified. 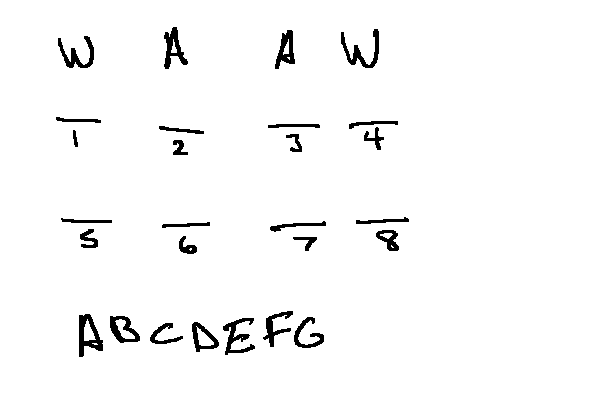 Note how the "row" together rules are drawn horizontally, while the "window" together rule is drawn vertically. Also, note how all of the diagrammed blocks have "/" in them. This is because we don't know the relative order of the actors in the together block, we just know that they have to be in the same row or along the same window. The caption for the image highlights the power of together rules to limit where the different groups of actors can go, and how you can "draw in" the structural effects of the rules by making "horizontal groups" match your diagram. 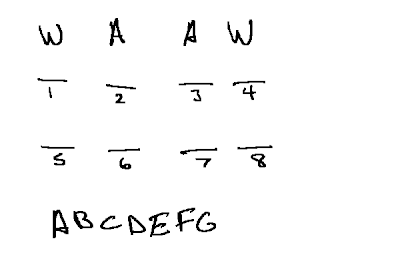 B/D and A/C/E are horizontal because they will be drawn that way on our workspace; similarly, F/G is vertical, because it will be vertical. The combination of the first two rules shows the power of min/max when applied to together rules. Because all five of the "horizontal" actors can't be put in the same row (remember, there are only four slots per row! 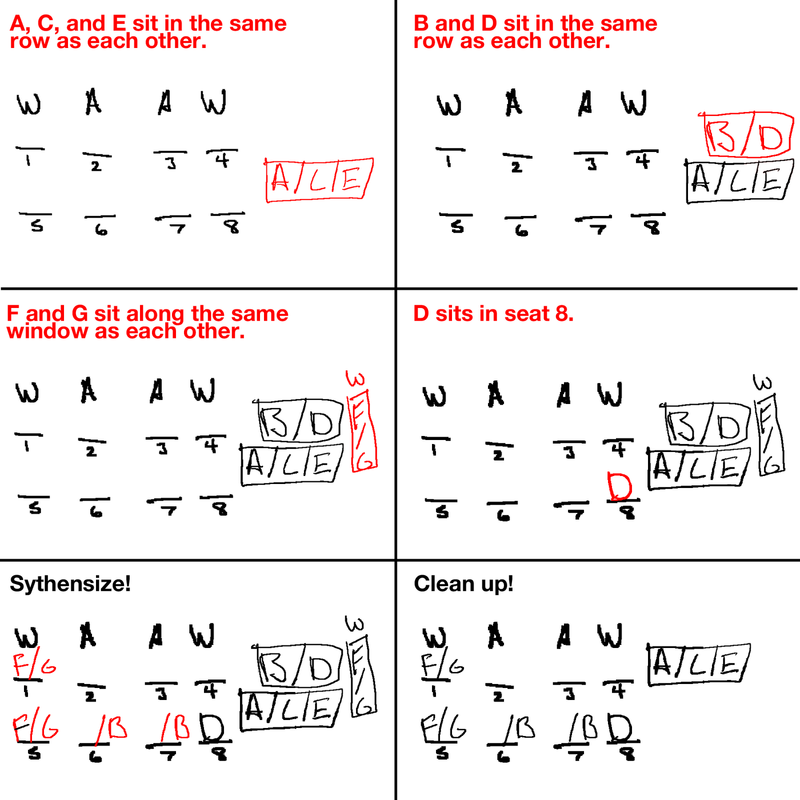 ), we know that B/D and A/C/E can't be in the same row. When combined with the F/G vertical block, we know that one of those two is going to combine with the A/C/E block to completely fill up a row. Once the fourth rule rolls along, we can place the B/D block in the second row. Because 8 is also a window, there's no longer space for the F/G block to sit together along the right-hand window. Notice how much more restrictive it is to place D in a column, rather than a row: that's because there are 4 slots per row, but only 2 slots per column. When you think about together rules and other limiting rules as fractions, it can help you see why knowing 1/2 of a given part of the game is much more powerful than 1/4. The synthesis panel shows us placing F/G in the other window column that has space (we still don't know which actor is in which slot, but they have to be along the same window), which means that B can only be in slot 6 or 7 to be in the same row as D.
The last panel "cleans up" the diagram by erasing the rules that we've already drawn into our workspace. We already know the only two spaces that each of B, F, and G can go, so we don't need to think about their rules anymore. The A/C/E block must be in the first row, however, so we can move up its block so that it aligns visually with where it can go. I don't like to draw in more than two possibilities for a single slot, so I'd leave the diagram as it is and start on the questions.